Blessed Jacobus de Varagine or Voragine (Italian: Giacomo da Varazze, Jacopo da Varazze; c. 1230 – July 13 or July 16, 1298) was an Italian chronicler and archbishop of Genoa. He was the author, or more accurately the compiler, of Legenda Aurea, the Golden Legend, a collection of the legendary lives of the greater saints of the medieval church that was one of the most popular religious works of the Middle Ages. Jacobus was born in Varagine (Varazze), on the Ligurian coast between Savona and Genoa. He entered the Dominican order in 1244, and became the prior at Como, Bologna and Asti in succession. Besides preaching with success in many parts of Italy, he also taught in the schools of his own fraternity. He was provincial of Lombardy from 1267 till 1286, when he was removed at the meeting of the order in Paris. He also represented his own province at the councils of Lucca (1288) and Ferrara (1290). On the last occasion he was one of the four delegates charged with signifying Pope Nicholas IV's desire for the deposition of Munio de Zamora - who had been master of the Dominican order from 1285 and was eventually deprived of his office by a papal bull dated April 12, 1291. In 1288 Nicholas empowered him to absolve the people of Genoa for their offence in aiding the Sicilians against Charles II. Early in 1292 the same pope, himself a Franciscan, summoned Jacobus to Rome, intending to consecrate him archbishop of Genoa. Jacobus reached Rome on Palm Sunday (March 30), only to find his patron ill of a deadly sickness, from which he died on Good Friday (April 4). The cardinals, however, propter honorem Communis Januae ("for the honor of the commune of Genoa"), determined to carry out this consecration on the Sunday after Easter. He was a good bishop, and especially distinguished himself by his efforts to appease the civil discords of Genoa among Guelfs and Ghibellines. A story, mentioned by Echard as unworthy of credit, makes Pope Boniface VIII, on the first day of Lent, cast the ashes in the archbishop's eyes instead of on his head, with the words, "Remember that thou art a Ghibelline, and with thy fellow Ghibellines wilt return to naught." He died in 1298 or 1299, and was buried in the Dominican church at Genoa. He was beatified by Pius VII in 1816. Jacobus de Voragine left a list of his own works. Speaking of himself in his Chronicon januense, he says: "While he was in his order, and after he had been made archbishop, he wrote many works. For he compiled the legends of the saints (Legenda sanctorum) in one volume, adding many things from the Historia tripartita et scholastica, and from the chronicles of many writers." The other writings he claims are two anonymous volumes of Sermons concerning all the Saints whose yearly feasts the church celebrates. Of these volumes, he adds, one is very diffuse, but the other short and concise. Then follow Sermones de omnibus evangeliis dominicalibus for every Sunday in the year; Sermones de omnibus evangeliis, i.e., a book of discourses on all the Gospels, from Ash Wednesday to the Tuesday after Easter; and a treatise called Marialis, qui totus est de B. Maria compositus, consisting of about 160 discourses on the attributes, titles, etc., of the Virgin Mary. In the same work the archbishop claims to have written his Chronicon januense in the second year of his episcopate (1293), but it extends to 1296 or 1297. 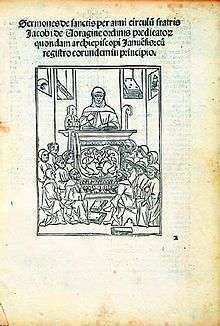 Title page of the 1497 edition of the Sermones de sanctis showing the author as a preacher, National Library of Poland. To this list his biographer Giovanni Monleone adds several other works, such as a defence of the Dominicans, printed at Venice in 1504, and a Summa virtutum et vitiorum Guillelmi Peraldi, a Dominican who died in 1271. Jacobus is also said by Sixtus of Siena (Biblioth. Sacra, lib. ix) to have translated the Old and New Testaments into his own tongue. "But," adds the historian of the Dominican order Jacques Échard, "if he did so, the version lies so closely hid that there is no recollection of it," and it may be added that it is highly improbable that the man who compiled the Golden Legend ever conceived the necessity of having the Scriptures in the vernacular. The Golden Legend, one of the most popular religious works of the Middle Ages, is a collection of the legendary lives of the greater saints of the medieval church. The preface divides the ecclesiastical year into four periods corresponding to the various epochs of the world's history, a time of deviation, of renovation, of reconciliation and of pilgrimage. The book itself, however, falls into five sections: —(a) from Advent to Christmas (cc. 1—5); (b) from Christmas to Septuagesima (6-30); (e) from Septuagesima to Easter (31-53); (d) from Easter Day to the octave of Pentecost (54-76); (e) from the octave of Pentecost to Advent (77-180). The saints' lives are full of fanciful legend, and in not a few cases contain accounts of 13th century miracles wrought at special places, particularly with reference to the Dominicans. The penultimate chapter (181), "De Sancto Pelagio Papa," contains a universal history from the point of view of Lombardy, or Historia Lombardica (History of Lombardy"), from the middle of the 6th century. The last (182) is a somewhat allegorical disquisition on the dedication of churches, "De dedicatione ecclesiae." The Golden Legend was translated into Catalan in the 13th century (BNP esp 44) and a first dated version was published in Barcelona in 1494. A French version was made by Jean Belet de Vigny in the 14th century. A Latin edition is assigned to about 1469; and a dated one was published at Lyon in 1473. 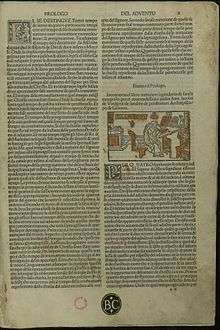 Many other Latin editions were printed before the end of the century. A French translation by Master John Bataillier is dated 1476; Jean de Vigny's appeared at Paris, 1488; an Italian one by Nic. Manerbi (? Venice, H75); a Czech one at Pilsen, 1475–1479, and at Prague, 1495; Caxton's English versions, 1483, 1487, and 1493; and a German one in 1489. All in all, during the first five decades of printing in Europe, editions of the Legenda Aurea appeared about two a year. Almost as popular were Jacobus' collected sermons, also termed "Aurei." Several 15th century editions of the Sermons are also known, and the Mariale was printed at Venice in 1497 and at Paris in 1503. Beside Legenda Aurea his other chief work is the Chronicon januense ("Chronicle of Genoa"), partly printed in Muratori (Scriptores Rer. Hal. ix.6). It is divided into twelve parts. The first four deal with the mythical history of Genoa from the time of its founder, Janus, called the first king of Italy, and its enlarger, a second Janus "citizen of Troy", till its conversion to Christianity "about twenty-five years after the passion of Christ." Part v professes to treat of the beginning, growth and perfection of the city; but of the first period the writer candidly confesses he knows nothing except by hearsay. The second period includes the Genoese crusading exploits in the East, and extends to their victory over the Pisans (c. 1130), while the third reaches down to the author's days as archbishop. The sixth part deals with the constitution of the city, the seventh and eighth with the duties of rulers and citizens, the ninth with those of domestic life. The tenth gives the ecclesiastical history of Genoa from the time of its first known bishop, Saint Valentine, "whom we believe to have lived about 530 A.D.," till 1133, when the city was raised to archiepiscopal rank. The eleventh contains the lives of all the bishops in order, and includes the chief events during their episcopates; the twelfth deals in the same way with the archbishops, not forgetting the writer himself. Voragine is relevant to mariology in light of his numerous Marian sermons, Sermones de sanctis per circulum anni feliciter and his Laudes Beatae Mariae Virginis. He describes the miracles of Mary and explains specific local customs and usages on Marian feast days. Since most of these usages do not exist anymore, Voragine serves as a valuable source for the study of medieval Marian customs. Theologically Voragine is one of the first of several Christian writers, who view Mary as mediatrix or mediator between God and humanity. In the mystical body of Christ, she is the neck through which all graces flow from Christ to his body. This view was later shared by others such as Bernardino of Siena, and, most recently, by one of the noted mariologists of the 20th century, Gabriel Roschini. ↑ The toponym Varagine is Lombard; the site appears in the Tabula Peutingeriana as Ad Navalia. ↑ Stace 1998:, "Introduction" p. x. ↑ Monleone, Iacopo da Varagine e la sua Cronaca di Genova dalle origini al MCCXCVII (Istituto storico italiano per il Medio Evo) 1941. ↑ Émile Mâle, L'art religieuse du XIIIe siècle en France (1898) devotes a full chapter to Legenda Aurea , which he avowed was his principal guide for the iconography of saints. Reames, Sherry L. The Legenda Aurea: A Reexamination of Its Paradoxical History (Madison: University of Wisconsin Press) 1985. Iacopo da Varazze, Legenda aurea G.P. Maggioni (ed. ), Firenze, 1998. Jacobus, and William G. Ryan. The Golden Legend: Readings on the Saints. Volume 1 and volume 2. Princeton, NJ: Princeton Univ. Press, 1993. Sermones.net - édition électronique d'un corpus de sermons latins médiévaux : academic website, with an electronic annotated edition of the model sermons collections composed by Jacobus de Voragine (the first collection published is the Sermones Quadragesimales, 98 texts). Also offers an extensive biography and bibliography on the author. Michael Ott (1913). "Blessed Jacopo de Voragine". In Herbermann, Charles. Catholic Encyclopedia. New York: Robert Appleton Company. "Jacopo de Voragine". Encyclopædia Britannica (11th ed.). 1911. Wikimedia Commons has media related to Jacopo da Varazze.